Germany impresses everyone who takes the time to visit, whether it's with medieval towns or castles along the Rhine or modern cities brimming with cultural activities and nightlife. But Germany is also a rather large country (for Europe) and the vast majority of people visit only one or two corners of the country at a time. One thing I've learned from the hundreds of comments on my Eurail Passes and European itinerary Q & A posts is that great numbers of those covering Europe in two or more weeks like to stop in Germany along the way. So rather than assume people are trying to cover all of Germany, I'm going to point out the highlights that travelers can weave into longer trips of the whole region. I'm from California but my mother was born in Germany and my older brother has lived there for 15 years so I've had the luxury of seeing all the best tourist cities and quite a few others. I'll ignore most of the lesser destinations and try to point people toward the best of the best. Not all that long ago, Berlin felt a bit like a secret that only “advanced” travelers knew about. But now everyone seems to realize that Berlin might be Europe's most exciting city, on the cutting edge of art, design, and nightlife trends. 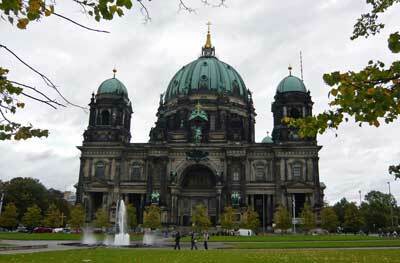 Better still, Berlin is a bargain, with good hotels at great prices. Prices of most things are noticeably lower than in Europe's other great cities such as London, Paris, or Rome. One complication, however, is that Berlin is very large and spread out. Similar to London and Paris, it has multiple central areas so you'll need to use the extensive public transportation network, and stay at least 3 nights or more. Start with the famous free Berlin Walking Tour to get oriented with parts of East Berlin, and plan on at least a day exploring the former West Berlin as well. Bonus: English is so widely spoken in Berlin that you can literally ask locals in it (as long as they are under 50 and/or involved in tourism), unlike other German cities where it's still considered polite to start the conversation in German asking if they speak English. Most of the widely-known cliches about Germany, including lederhosen, yodeling, and those giant beers, are actually Bavarian cliches. Bavarians still identify themselves as Bavarians first and Germans second, and Munich is obviously the place to soak all of this in. There is a reasonably compact city center, but there are also extensive parklands and plenty of other attractions spread around a bit, including the BMW Museum. One word that most people use to describe Munich is “pleasant,” with a more relaxed and outdoorsy vibe. Of course there is also the famous Oktoberfest, running from mid September to early October, but before you plan for attending, realize that hotel rates literally triple for the festival. Still, if you can include Munich on your trip, you won't regret it. Not far from Nuremberg and along the so-called Romantic Road in Bavaria, sits Rothenburg ob der Tauber, which is one of the most perfectly preserved medieval towns in Europe. It's a truly lovely place but there is a little trick to enjoying it properly. Similar to Venice, Italy, this town is packed with bus tours every day, so it feels unusually crowded between the hours of 10am and 4pm or so. So just as with Venice, the trick is to spend a full 24 hours there, which will allow you most of the morning and all evening to practically have the place to yourself. You can get great views while exploring the city walls, but the highlight of a visit might be the Nightwatchman's Tour at 8pm (except in winter). It's a famous and entertaining walking tour explaining life in the city's 14th Century heyday. In some ways, Füssen is similar to Rothenburg ob der Tauber in that both towns are very popular for day trippers, and pleasantly empty at night. In this case, everyone is coming to see Neuschwanstein Castle, which was famously the inspiration for Sleeping Beauty's castle in Disneyland. The castle is on a hill just above the town, and is obviously worth a visit if you are anywhere nearby. If you take a bus tour then you'll be herded in and out with the huge crowds, so this is another that is worth staying overnight and visiting on your own terms. The town has other lovely castles plus historic churches and a generally nice center. Conveniently, Füssen is at the southern end of the Romantic Road, so it's easy to visit by car, bus, or train between Rothenburg ob der Tauber and Munich. The “Black Forest” has a famous and interesting name, but it's really just a mountain range (and forest) in the southwest of the country, with nothing particularly special about it. On the other hand, it's the home of cuckoo clocks among many other traditions, so a stop here is worth considering if you are interested in getting to know more of Germany and its culture. The area is also home to Baden Baden, which is a spa town famous for attracting wealthy to its thermal baths and casino. The thermal baths are open to the public, and popular with tourists of all income levels, so they are worth a look if this is your thing. Probably not a city that is worth keying a whole holiday around, Cologne (Köln in German) is still the most interesting destination in the very populous area in the country's west. It was mostly flatted in WWII, but the famous gothic cathedral survived, and it alone is worth at least a quick stop in the city. Beer drinkers appreciate Cologne for its somewhat unique version of lager known as Kölsch that is served in small glasses in all of the town's many bars and pubs. There's also one of Germany's most impressive Christmas markets near the cathedral and train station, which is yet another reason for an overnight stop in December. Germany's second largest city is also one of Europe's richest, but it's also a large seaport with a rough and tumble past. So it has high end shopping areas and lakeside mansions, but also perhaps the most famous red light district outside of Amsterdam. The Reeperbahn, as it's known, is still a raucous nightlife center that reminds visitors how it was made famous as the place where the Beatles perfected their craft as a house band. Hamburg also boasts its share of palaces, museums, and even the world's largest model train railway display. But in spite of this, the city doesn't seem to draw in as many tourists as one might think. Honestly, if you are going between Amsterdam and Berlin and/or Copenhagen, it's a worthwhile stop. If you aren't, then it's probably better to concentrate in other regions. Frankfurt is famous as the home of one of the world's busiest airports, and as home to most of Germany's famous banks and its stock exchange. But none of these are good reasons to visit the city for sightseeing purposes. In other words, don't just plan on staying a couple days in Frankfurt because you are flying in or out of its airport, or because you assume it has interesting things to see. Actually, Frankfurt does have an impressive city center and some interesting architecture and a few good museums, so visiting isn't a waste of time, it just might not be a good use of time. Germany's rail system is so efficient that you can land at the airport here and be in one of the better tourist cities only a few hours later, without ever making camp in Frankfurt, so that's usually the way to go. A great alternative to Frankfurt is Mainz (1 Day). The 10th Century Cathedral, Marc Chagall stained glass windows at St. Stephen’s Church, and the Gutenberg Museum are sites of at least regional importance, possibly world class. Our family took an early morning ICE train from Paris, arrived by noon, and had plenty of time for all three sites, plus walking around the central market before evening dinner. One could stay in Mainz like we did and catch a quick 25-minute train the next morning to the Frankfurt Airport, or catch an evening train to the airport if the next morning’s flight is early. There are also great train connections through Frankfurt and Manheim. I stumbled across your site while having a quick look at eurail passes – your site is brilliant, thanks – we are trying to decide if a eurail pass is worth it or if we should just hire a car. I’m leaning towards a select 2 person saver 1st class eurail pass to do the bigger transfers, then only hiring a car for getting about for the couple of days spent once we get there. My husband says rail passes are no good and we should just hire a car… not sure how fun that much driving will be! Any thoughts? I’m always happy to hear that this information is useful, so thanks for mentioning it. Yours is an interesting situation for transportation options. First off, rail passes can be excellent value for certain types of trips, and poor value for others. And driving a hired car in Europe is sort of the opposite. Basically, you DON’T want to rent a car to drive between large European cities where you mainly want to explore the city once you arrive. Parking can be absurdly expensive (they do this on purpose, to discourage people from driving) in or near city centers, and the only affordable option is to stay in hotels on the edges of the city that have free or cheap parking. However, if you stay on the edge of town it would mean taking a bus or trolley into the tourist district each day, and it’s just not nearly as efficient or enjoyable for sightseeing. On the other hand, if you want to visit small towns or wine regions or national parks and this sort of thing, then driving a hired car is far easier and more efficient. The tricky thing is you seem to have a mix of both types of places on your list. Also, if you only have 3 weeks then I’d limit the number of places you want to visit to about 7 or 8 cities, or maybe 10 total if you are including some smaller towns and you are driving. I wouldn’t recommend less than 3 nights each in Berlin, Paris, or Rome, and even 2 nights will feel rushed in Vienna, Salzburg, or Florence/Tuscany. And I’d save England, Poland, Hungary, and Czech Republic for a future trip, as 3 weeks is already a really rushed trip to Germany, France, Italy, and Austria. Again, I recommend 3 nights in larger cities and 2 or 3 nights in even smaller cities. If you are focusing more on regions like the Loire Valley then a car is probably best, but if you are more interested in seeing the famous sights in the larger cities then a train is best. Thank you SO very much for this site. It is very helpful and I will be referring to MANY articles as I plan our upcoming trip. We will be taking our 18 and 15 year old to Germany for 2 1/2 weeks in December. They have been to France, Italy, Spain… and we would like to focus on Germany, Austria, Prague, Switzerland. We generally stay at budget friendly airbnb type accommodations. Can you suggest an itinerary? We like to do A LOT in a day. Thank you so much. I can’t wait to peruse more of this site! I’m glad to hear that you find this information to be useful, and I’ll be happy to try to help. I can’t suggest an itinerary, but I can give you some advice and you should be able to decide on some things. I can also help you with details once you are getting a plan together. As for transport, the train is the best for visiting cities, and it’s very pleasant. A rental car can be better for focusing mostly on smaller towns and rural areas. A car for 4 people can be cheaper even for visiting cities, but parking in Europe is expensive and challenging. If you drive between cities you’ll be tempted to book hotels on the outskirts of towns that have parking lots. But then when you want to see the sights you’ll have to drive into town and pay a fortune to park, or take a bus or taxi into town, which can also get expensive and waste time. My preference is to take trains and book hotels near train stations, so you maximize your sightseeing time with no stress or hassle. Switzerland is much more expensive than Germany, Austria, or the Czech Republic. It’s also extremely nice and has the best scenic views in Europe. If you think you can afford it then I’d spend at least 7 or 8 days in Switzerland and the rest in Germany and maybe Austria. If you want to keep a more modest budget then Germany and Austria can be kept reasonable, and Prague is a bit cheaper even. You could combine the places in Germany listed in this article above, and even include Salzburg and Vienna if you like. I highly recommend staying 3 nights in any larger city you visit, though 1 or 2 nights can be enough in smaller towns like Rothenburg ob der Tauber. If you are going in December then I wouldn’t recommend rural towns and the countryside because the days are short and some things close down for the season. The cities are all vibrant in December, and you’ll be able to catch some of Germany’s famous Christmas markets. I’m going to Germany/Switzerland for a month for research purposes. I only have to conduct research for about 3 hours a day (hoping to do so in the morning between 7-10 AM), so I’m hoping to spend the rest of my time exploring. Your site has been EXTREMELY helpful in helping me identify some great places to visit. I’m wondering if you can give me an idea of whether or not this itinerary is feasible and if you have any suggestions to improve it. Also, what train passes would you recommend? I’m having trouble determining where the Eurail train and the German rail train make stops. Thanks! I’m happy to hear that this information has been helpful. Your plan looks really good and extremely well planned out. Personally, I’d probably plan fewer of those stops where you are going to a different city each day. For most people that means spending half your day in transit so you don’t get to do much sightseeing. But for you it seems that these cities are mostly quite close together, so those train rides might only be an hour or two in most cases. Still, I find that it gets exhausting only staying in each place for one night, if you do it for several days in a row. Another thing I’ll mention is that for most visitors to Germany, there is a big drop-off from places like Berlin, Munich, and Rothenburg ob der Tauber to places like Dresden and Leipzig. I have a lot of family in Germany (my mother was born there and my brother lives there now) so I’ve been to many of these secondary towns. Some of them get very few tourists from non-German speaking people, so it can be a bit challenging. My best advice is that if there is something specific you want to see in each of these places then go and see it. But don’t just go to cities because they have a fairly large population. I’ve made that mistake before myself quite a few times. Hi Roger, From your Switzerland forum, I did plan my vacation on lines of what you had suggested. This summer, I have three countries in mind. To start with Austria at Venice, head to Prague and then to Cesky Krumlov ( as suggested by you ) then to Salzburg and finally to Munich. I have clear 15 days in June this year at these places.We are a family of four, including one teenaged boy and the other boy who will hit his teens soon. Ofcourse we want to minimise the travel and see the best places. The idea is to fly in to Vienna and then fly out of Munich. Could you broadly tell me the best places to cover and time spent at Vienna, Prague, Cesky Krumlov, Slazburg and then at Munich. Its sad, but that would leave little or no time for Berlin. Could you please suggest the number of days at each location that I mentioned and things to cover. Also I would value ur input if i need to incorporate Berlin and compromise with other places. As i said , I did rely on your inputs and I was glad that I did for my Switzerland trip last summer. Cesky Krumlov is a small town and you could enjoy it in only two nights, although you wouldn’t get bored in three nights. Aside from that one, the other cities on your list are all very large and packed with great sights. In other words, if you have 15 total days I would choose 5 cities and do them in 3 nights each. If you were REALLY in a hurry and you wanted to see all 6 cities I would recommend 2 nights in Cesky Krumlov, 2 nights in Vienna, and 2 nights in Munich, which would give you 3 nights each in Berlin, Prague, and Salzburg. Or you could do Salzburg in only 2 nights and keep Vienna at 3 nights. Salzburg is an extremely scenic city with a lovely historic center, while Vienna is a “grand” city that has been an important capital for hundreds of years and has very impressive architecture and culture. Another thing about Cesky Krumlov is that it’s small, so it’s more relaxing than the others, and it’s quite cheap as well. But if this is your first trip to this part of Europe I would probably save Cesky Krumlov for a future visit and add in Berlin. You could do Vienna to Prague to Berlin to Salzburg to Munich in 3 nights each. Unfortunately, the trains from Berlin to Salzburg require a train change in Munich, but it’s only 1 hour 45 minutes from there to Salzburg. Thanks Roger. I consider that Vienna – Prague-Salzburg- Munich- Berlin is preferred route. Kindly correct me if am wrong. Also like Switzerland , do these countries also have luggage lockers ? Based on your advice, we did a day tour at Berne and we were able to leave our stuf at Berne. SImilarly if we can manage to put our luggage at Cesky Krumlov, we could probably do a day tour on our way from Prague to Salzburg. Hi Roger, I’m helping my 24 year old son plan his first backpacking trip, which will be through Germany (and probably Amsterdam.) He will be traveling alone. I’m looking for any suggestions that will help create an itinerary for best traveling by train and bus and short flights where needed. He’s interested in everything from the castles in Bavaria to the romantic road to munich, dresden, cologne, hamburg, and more! It’s an ambitious agenda and I need help formatting a safe and enjoyable travel agenda. Thank you for any direction! That sounds like a lot of fun and it’s nice of you to help him get the planning started. I’d recommend focusing on train travel because in Germany and the Netherlands it’s so comfortable and efficient. Buses tend to take about twice as long and are less comfortable, and with that many stops there should be no use for flights within that region. Even a 1-hour flight will take about 5 hours from city center to city center when you add in all of the airport transfers and waiting times. It sounds like this will be mostly train journeys of between 2 and 5 hours each. I actually did a 7-week trip like this all around Germany and Benelux about twenty years ago. At the time I used a rail pass and that might be the best strategy for this trip as well. Train tickets in this region are quite cheap if you buy early enough to get the supersaver-type fares, but then when those are all gone the fares are quite expensive. It’s worth checking some of the journeys (say, Cologne to Frankfurt and Frankfurt to Munich to check the prices if you buy two months out, and those same journeys if you buy only a few days in advance. There will probably be a big difference. So the strategy could be either to plan the whole trip in advance and buy all of the cheap train tickets at least a month or two in advance, OR to get a rail pass, which would cost more but also allow him to just hop on any train as it’s leaving and find a seat. The places I discuss in the article above remain as my best suggestions for trips to Germany. If he has specific interest in medieval castles or cars or something else that Germany specializes in, there are a lot more interesting options. But for general interest these are my top picks. Dresden is kind of dull in my opinion, at least compared to Berlin, which is so huge that he could spend two weeks there. And the Black Forest isn’t as photogenic as most people expect. Also, if he goes to almost any city that isn’t on this list, speaking at least some German is very helpful. For example, Freiburg is the main city in the Black Forest area and very few people speak English there (my brother lives very near there so I speak from experience). People in hotels and hostels will speak some English and people working in restaurants will speak enough to help you order, but it’s not all that easy. Berlin, on the other hand, has become (similar to Amsterdam) a city where everyone speaks English to the point that many locals are really annoyed by it. Stumbling on your website trying to find good itinerary ideas for our upcoming trip to Europe. We’re thinking about going 3 weeks for this. Majority of the trip is for Germany for Berlin Marathon and perhaps Oktoberfest in Munich. What are other cities/countries you can recommend? wanting to include Amsterdam on this trip, perhaps Switzerland if it is doable. My top suggestions for what you have in mind would be to add Prague between Berlin and Munich if the timing works. And as I mention in the article, Oktoberfest gets really expensive in Munich for hotels and you also want to book a spot in a beer tent in advance because those who stand in the queues for empty places can be there for hours. After Munich I’d highly recommend Salzburg, as it’s really lovely and a short train ride from Munich. Amsterdam is also fantastic and it’s a good stop before Berlin, or after Berlin if you go in the other direction. That should give you enough great ideas for most of your three weeks, assuming you’ll be spending a decent amount of time in Germany itself.